Page of "Strike Harbinger/FX-Unit Yuki : The Henshin Engine Collabo!". 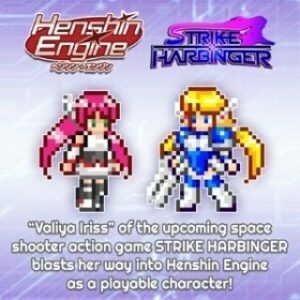 Strike Harbinger/FX-Unit Yuki : The Henshin Engine Collabo! HOLY CRAP! Valiya Iriss, the heroine in the upcoming space shooter action game STRIKE HARBINGER, will be a playable character in FX-Unit Yuki : The Henshin Engine! The Strike Harbinger team and Saru Studio have a friendly relationship and have noticed similarities with the character aesthetics and thought it would be a great idea for us to have Valiya playable in FX-Unit Yuki : The Henshin Engine. Yuki will also appear in Strike Harbinger in some capacity as well, more news on that later so make sure to follow the Strike Harbinger page located at: http://www.strikeharbinger.com/ to find out more! And remember, our Kickstarter is still live and we are very close to our funding goal! So make sure to share with all your friends! « YOUTUBERZ REVIEW FX-Unit Yuki : The Henshin Engine! Used to spend a fortune in the arcades on Space Harrier. Not sure any game since has ever held my attention as much.